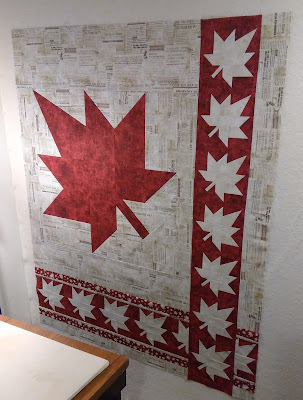 I started my Canada 150th quilt last weekend. It really is coming together very quickly. A couple of hours each day on four days this week has brought me all the way to borders, where I always stall because I don't like sewing on borders. In another day or two (depending how long I dither about the borders) this will be a finished top, then I can dither some more about the basting, then the quilting. I've given more thought to a sew-along. I don't think I have time to organize one properly at this point. What I plan to do instead is write the pattern (hopefully in the next week or two) then offer it as a free pattern for a few months. 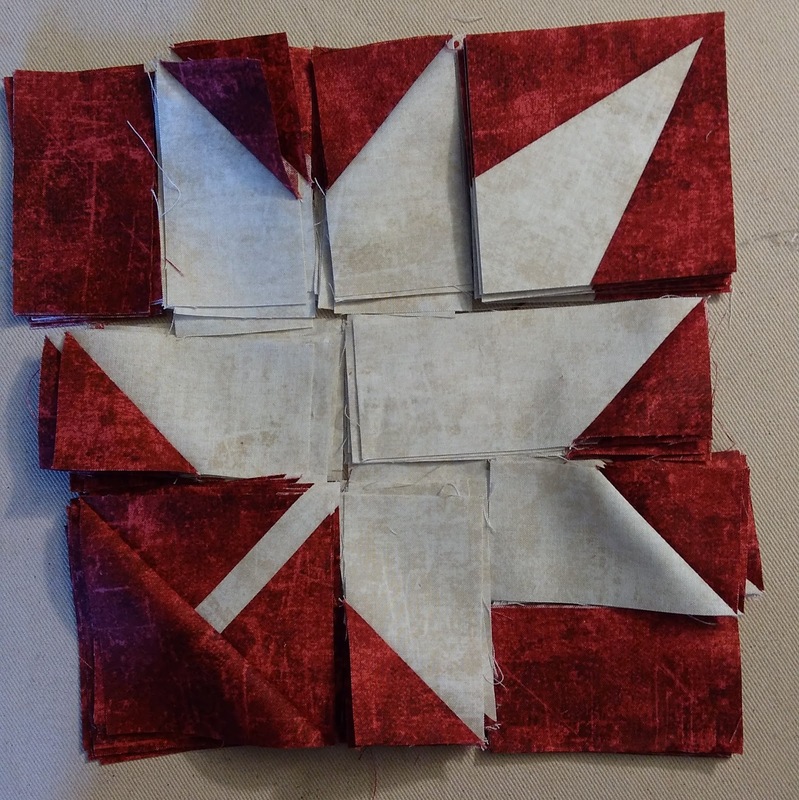 I'll also suggest a sewing schedule for those who want a finish by Canada Day, July 1st. 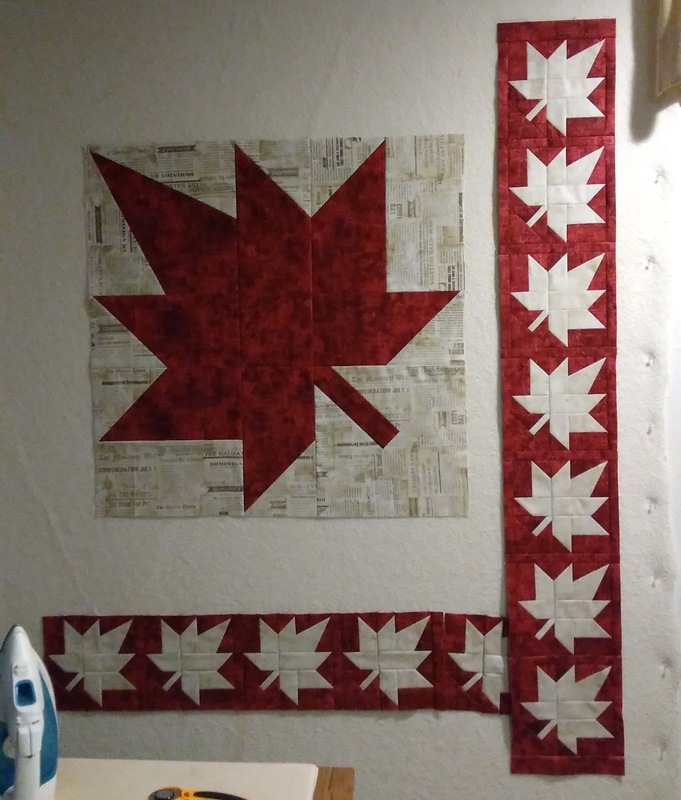 On July 1st, I'll have a linky party for anyone to post their progress, flimsies or finishes of this or any other Canada quilt. It's looking beautiful!! Love it!! I am really liking this! 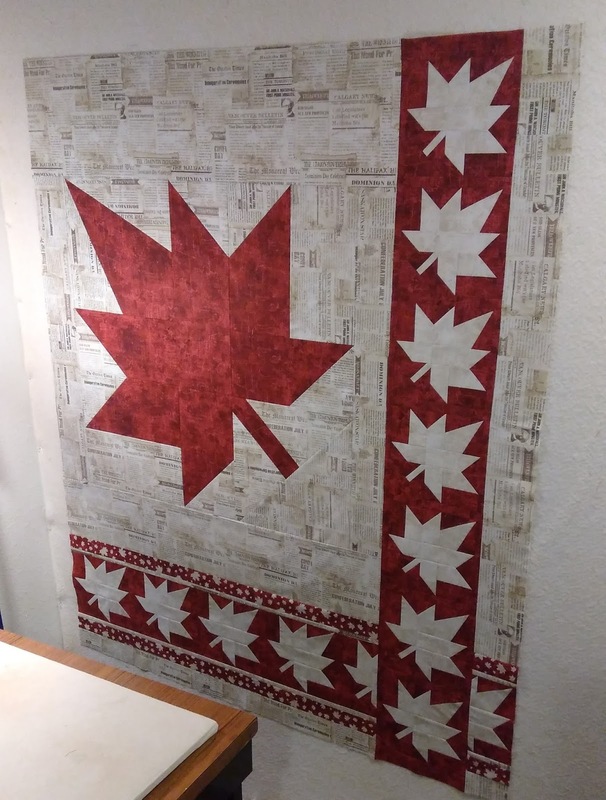 Wish I could make this for my Canadian MIL--her birthday is in July. Just don't know if I can squeeze it in between all of the other commitments. It's looking good so far. That background fabric is really interesting. Lovin' the pieced borders. Can't wait to see the borders, this is coming along lovely. It's looking great. I would love a free pattern. Thank you. 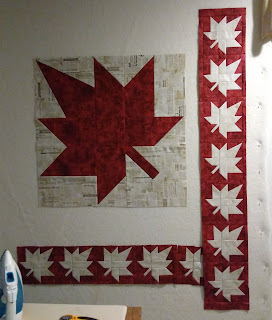 I love the look of your quilt so far and definitely plan on making one in time for Canada Day. I can see some great place mats or table mats, too! I love how this is looking. The newspaper print makes for an interesting background. I understand the dithering! I'm at quilting dithering right now (having decided to skip borders entirely). Good luck with yours! Wow! I love your layout on this quilt. Wish I were as organized as you are with your daily carrying out of your plans! That's a beautiful block. ---"Love"
Very pretty. I too put off borders.... and then when I do them they are usually not as bad as I feared. I like your plan Joanne! I also REALLY like your quilt! Your quilt is looking beautiful! Great design! Very pretty! I love the asymmetrical design! You're so fast! I love it...I might even have to make one! Oh, those fabrics are so pretty! I love red and the background printed with words is fantastic. You are going to have a beautiful quilt. I am not Canadian but I have vacationed there several times and it has always been a wonderful time. That is awesome! I'm sure many Canadians will want to make it. 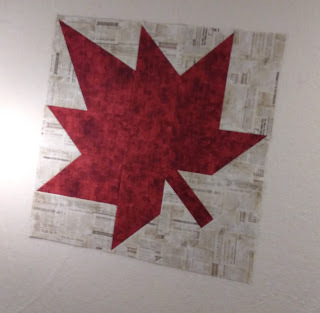 And the maple leaf pattern will work for anyone! Great design - love it!